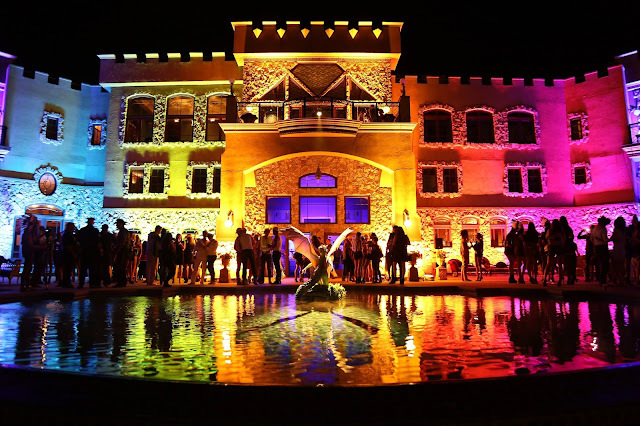 Recording Artist and Philanthropist Sir Ivan hosted a Royal Tea Dance Party for over 600 friends and music fans at his spectacular 15,000 square foot Castle in Water Mill on Saturday, August 22nd. Inspired by the White House, which was lit in rainbow colors after the Supreme Court’s decision on Marriage Equality, Sir Ivan turned his medieval style Castle into the largest disco flashing rainbow light show in the world. The epic party celebrated his new anti-bullying anthem and music video, Billboard hit “Kiss All The Bullies Goodbye,” featuring Taylor Dayne and produced by Paul Oakenfold. The night, which also served as a thank you to supporters of his charity, The Peaceman Foundation, featured a 5-hour set from Vienna’s Life Ball Resident DJ Sin Morera and non-stop dancing from 28 world class professional hustle and Latin hustle dancers from Stepping Out Studios. The evening reached a climax when Sir Ivan made a grand entrance, riding an Ironhorse Tejas custom made chopper motorcycle straight into his Castle through a packed dance floor. He then performed his new song in a leather biker cape embellished with a Swarovski encrusted peace sign, as the crowd roared in his Castle 54 themed nightclub. Special guests who donned Village People inspired costumes for the party included singer Pras from The Fugees, singer Aaron Paul, grandson of Omar Sharif and LGBT activist, Omar Sharif Jr., journalist Michael Musto, androgynous model Rain Dove and Calvin Klein model Harmony Boucher, “Orange is the New Black” actress Farrah Krenek, actor Colin Asercion, and The Village People’s former “Cowboy” himself Randy Jones. In the battle against bullying, Sir Ivan and his Peaceman Foundation have donated over $200,000 to 10 non-profit organizations that combat bullying including: It Gets Better Project; the Gay, Lesbian & Straight Educational Network (GLSEN); the Born This Way Foundation; Pacer’s National Bullying Prevention Center; Parents & Friends of Lesbians & Gays (PFLAG); Stomp Out Bullying; Campus Pride; Love is Louder/The Jed Foundation, the Anti–Defamation League and The Trevor Project. The music video for Kiss All The Bullies Goodbye was directed by MTV and BET award winning director Erik White, and net proceeds from video views, song streams and downloads will be donated to anti-bullying initiatives.